Watertown Records, Comprising the first and second books of town proceedings..., Watertown, Mass. : Fred G. Barker, (1890) , Vol. 3, p. 137. George Arthur Davis, Davis and fifty allied colonial families of New England, , at https://books.google.com/books?id=kFVGAAAAMAAJ . Augusta, Me. : Kennebec Journal, (1956) , p. 107. "Maine Births and Christenings, 1739-1900," database, FamilySearch (https://familysearch.org/ark:/61903/1:1:F43L-5PP : 4 December 2014), Edith Helen Mason, 22 Sep 1874; citing CIVIL, FRYEBURG, OXFORD, MAINE; FHL microfilm 10,915. 1880 United States. Bureau of the Census. 10th census, Rhode Island, 1880 federal census : soundex and population schedules, Washington, D.C.: The National Archives, ([19--?]) , FHL Film 1255213; National Archives Film T9-1213; Page 317C. "Maine Births and Christenings, 1739-1900," database, FamilySearch (https://familysearch.org/ark:/61903/1:1:F4SZ-1X3 : 4 December 2014), Edwin Howard Mason, 02 Mar 1836; citing Waterford, Oxford, Maine; FHL microfilm 12,625. 1880 United States. Bureau of the Census. 10th census, Illinois, 1880 federal census : soundex and population schedules, Washington: The National Archives, ([19--?]) , FHL Film 1254240; National Archives Film T9-0240; Page 379C. Henry Bond, Genealogies of the Families and Descendants of the Early Settlers of Watertown, Massachusetts, , at https://books.google.com/books?id=_oc6AQAAIAAJ . Boston: Little,Brown & Company, (1855) , pp. 358-62. "Maine Births and Christenings, 1739-1900," database, FamilySearch (https://familysearch.org/ark:/61903/1:1:F4QJ-3M9 : 4 December 2014), Eliza Maria Mason, 05 May 1841; citing Waterford, Oxford, Maine; FHL microfilm 12,625. "Maine Births and Christenings, 1739-1900," database, FamilySearch (https://familysearch.org/ark:/61903/1:1:F4SZ-8M9 : 4 December 2014), Eliza Mason, 05 May 1841; citing Waterford, Oxford, Maine; FHL microfilm 12,625. 1880 United States. Census Office. 10th census, 1880 federal population census, Washington, District of Columbia: National Archives and Records Service, ([19--]) , Census Place: Waterford, Oxford, Maine; Roll: 484; Family History Film: 1254484; Page: 356A; Enumeration District: 140; Image: 0837. "Maine, J. Gary Nichols Cemetery Collection, ca. 1780-1999," database with images, FamilySearch (https://familysearch.org/ark:/61903/1:1:QKXM-WQC7 : 9 October 2015), Eliza M Mason, ; citing Waterford, Oxford, Maine, United States, Cemetery Elm Vale, Maine State Library, Augusta; FHL microfilm 2,184,564. "United States Census, 1860", database with images, FamilySearch (https://familysearch.org/ark:/61903/1:1:MHZV-44Z : 30 December 2015), Simeon Mason, 1860. "United States Census, 1870," database with images, FamilySearch (https://familysearch.org/ark:/61903/1:1:M4F7-FWL : 17 October 2014), Simeon Mason, Missouri, United States; citing p. 4, family 30, NARA microfilm publication M593 (Washington D.C.: National Archives and Records Administration, n.d.); FHL microfilm 552,323. Frederick Stam Hammond, History and genealogies of the Hammond families in America, Vol. 1, , at https://archive.org/stream/historygenealogi11hamm . Oneida, N. Y.: Ryan & Burkhart, (1902) , p. 76. "Massachusetts, Town Clerk, Vital and Town Records, 1626-2001," database with images, FamilySearch (https://familysearch.org/ark:/61903/1:1:FCSC-CLZ : 13 July 2016), Nathaniel Perry and Elisabeth Mason, 13 Oct 1739; citing Marriage, Watertown, Middlesex, Massachusetts, United States, , town clerk offices, Massachusetts; FHL microfilm 892,249. "Massachusetts Births and Christenings, 1639-1915," database, FamilySearch (https://familysearch.org/ark:/61903/1:1:F45Z-PNL : 4 December 2014), Moses Perry, 19 May 1741; citing Sherborn, Middlesex, Massachusetts, P 134 R 5; FHL microfilm 872,789. 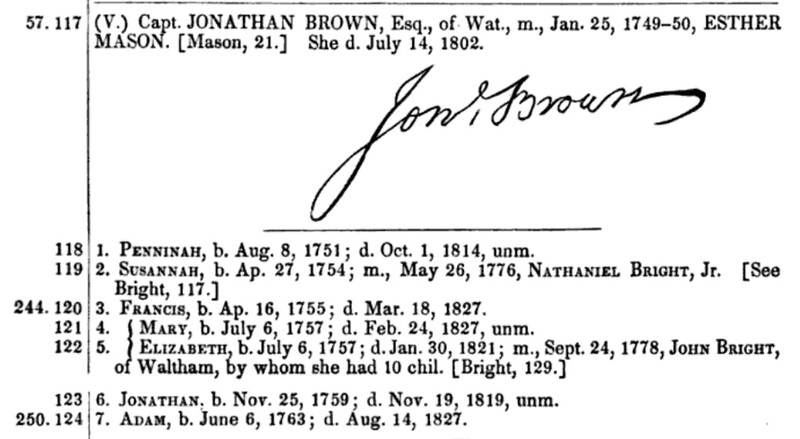 "Massachusetts Births and Christenings, 1639-1915," database, FamilySearch (https://familysearch.org/ark:/61903/1:1:F45Z-P5H : 4 December 2014), Edward West Perry, 08 Mar 1743; citing Sherborn, Middlesex, Massachusetts, P 139 R 5; FHL microfilm 872,789. "Massachusetts Births and Christenings, 1639-1915," database, FamilySearch (https://familysearch.org/ark:/61903/1:1:FCWX-MZK : 4 December 2014), Daniel Perry, 04 Apr 1746; citing SHERBORN,MIDDLESEX,MASSACHUSETTS, ; FHL microfilm 164,693. "Massachusetts Births and Christenings, 1639-1915," database, FamilySearch (https://familysearch.org/ark:/61903/1:1:FCW6-B4B : 4 December 2014), Hezekih Perry, 15 Dec 1750; citing SHERBORN,MIDDLESEX,MASSACHUSETTS, ; FHL microfilm 164,693. Watertown Records, Comprising the first and second books of town proceedings..., Watertown, Mass. : Fred G. Barker, (1890) , Vol. 3, p. 141. Charles Hudson, History of the Town of Lexington, Middlesex County, Massachusetts, Vol. 2, , at https://books.google.com/books?id=3MUMAAAAYAAJ . Boston and New York: Houghton Mifflin Co., (1913) , p. 412. Watertown Records, Comprising the first and second books of town proceedings..., Watertown, Mass. : Fred G. Barker, (1890) , Vol. 3, p. 125. Watertown Records, Comprising the first and second books of town proceedings..., Watertown, Mass. : Fred G. Barker, (1890) , Vol. 3, p. 130. Watertown Records, Comprising the first and second books of town proceedings..., Watertown, Mass. : Fred G. Barker, (1890) , Vol. 3, p. 135. Watertown Records, Comprising the first and second books of town proceedings..., Watertown, Mass. : Fred G. Barker, (1890) , Vol. 3, p. 138. Watertown Records, Comprising the first and second books of town proceedings..., Watertown, Mass. : Fred G. Barker, (1890) , Vol. 3, p. 147.